Sal had always considered Moda to be a genuine badass, but the Foundry had done an efficient job of making her more machine than human. Moda had about as much personality as a disposable dinner tray. “I don’t know what she’s talking about!” Morgan was choking on his shock. The Foundry had ripped off Moda’s arms and legs and screwed on tech replacements with her conscious the whole time. Still, they were fluffy bunnies compared to Max Moby. The Foundry were machines, incapable of emotion and empathy. Moby was a living, feeling human. The first option was so tempting, but Sal didn’t even pretend to entertain it. It wasn’t going to happen. She grunted and jumped from her chair, storming towards the rear of the ship. As she passed over the grates, she was startled by another bout of banging and yelling from below. “Not now!” she yelled, stamping her feet. Sal carried on, opening a hatch and slipping into the engine room on the lower level. It was all sparking wires, unconnected tubes and smoking machine parts. Sal tried her best not to electrocute herself on the way to the spinning thrusters right at the back. The left thruster was shot, had been for months, but a replacement cost more than a whole new ship. For now, a little bit of what Morgan called Sal Magic had been getting them through. “Come on, girl. One more ride,” Sal whispered. She recalled when Morgan had first presented this leaking deathtrap in place of the ten-thousand credit bounty Sal thought they were collecting. Back then the ship was called FL296. It was outdated, ugly and its jump drive was completely busted, meaning she was only good for single-system travel. Since then, Morgan had made but one improvement, and only because all it cost him was a can of paint. He had changed her name to Light Tripper and painted it in bright orange across her side. Sal begrudgingly admitted that she liked the name and as time passed, that fondness extended to the whole hunk of junk. After all, she was quick as a hiccup and could probably outrun a shooting star if the situation called for it. Sal set her mind back to her task. She spat into her hands and rubbed them together. With her hands glowing cobalt blue, she gripped the gears of the thruster and closed her eyes tight, remembering how the last time she did this her hair stood upright for weeks. Sal felt the power surge through her, energy hot and raw, coursing through her veins. It was intense, exhilarating and frightening. Sal could never be sure what would happen when she turned it on, this time though, the result was just what they were after. The left thruster roared into action and without putting a single hair out of place. “Way to go, baby!” Morgan hollered from the cockpit. Sal let slip a smile before scurrying back through the engine room and rejoining Morgan. She spied the Denians approaching, fully regenerated and tearing through the corridor. Her shotgun hunk must not have made it. Poor guy. Whoever he was. Moda turned her gun on Kar, who drew his just as quickly. 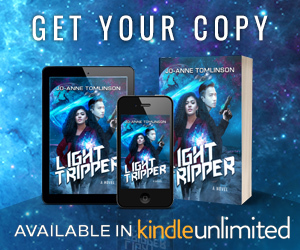 There was yelling, Sal couldn’t quite make out the words, but each of them took turns gesturing towards Light Tripper while keeping their weapons trained on each other. “Departure granted, Light Tripper,” management crackled back. The steel floor beneath the ship began to descend, moving them from the hold to the landing bay. Sal rocked impatiently in her chair, watching helplessly as Kar and Moda appeared to make a truce and charged the ship in a joint effort. Light Tripper came to a stop with a heavy bump as she set down in the landing bay. Sal looked up, watching a grated plate slide into place above them, sealing them off from the hold. “That was all you,” Morgan replied, accessing the holo-panel again and inputting their take-off sequence. “I thought you were doing fine just roughing them up. You’re getting stronger and faster. But then you’re all like ‘stab stab, cut cut’,” he chuckled, making a thrusting motion with his hand. “Showing off,” Morgan said with a grin. Sal patted her grumbling belly. Now she was super hungry. A double cheeseburger with onions, pickles and a thick slice of grubroot. Hot damn. That would hit the spot. If only the stupid replicator worked. For some reason it only made clam chowder or a green sludge by-product. Instead Sal poked around the control panel and found a half-eaten bag of dehydrated protein rations. They had three cases in the cargo hold that they’d swiped from a mining transport while it was being loaded on Klymus. They tasted like they looked, which was essentially dry, beige strips of goopa, but they would do the job of shutting up Sal’s stomach for another day. Sal popped one into her mouth. She could hear Kar and Moda pounding on the steel above them. “That was pretty close,” she sighed. Morgan put all power into the thrusters as the loading bay doors opened, revealing the infinite black of space beyond. “You worry too much. Just try to control yourself next time. Outbursts like that is why I don’t take you to nice places,” Morgan said as Light Tripper surged forward, leaving a scorching vapour trail behind it. Regardless of what he said, Sal would continue to worry about it, obsess even. It was added to the long list of Morgan screw-ups that were going to get them killed. Watching Enos grow small in the distance didn’t make Sal feel any safer. The Denians had ships as well… fast ones… with guns and the latest gossip in the system was that Moda had obtained a Starjumper with some sort of experimental hyper-speed enabler. Could that be Kar or Moda? No. Neither would need to steal a cruiser. Morgan’s face went blank, trying to recall exactly what Sal was talking about. None of this seemed to be ringing a bell for Morgan. “He shot you in the leg!” Sal yelled with frustration, grabbing Morgan’s trousers and hoisting his leg onto the control panel. She pulled back the stiff, grubby fabric revealing a poorly wrapped bandage around his calf that was leaking blood. Sal couldn’t be bothered arguing or reminding him that of all the pirates and hunters on Agrios who hated Morgan, Trick probably did so the most. After all, Morgan had crashed one of Trick’s best ships into a desert after drinking his way through half the moonshine cargo. Luckily Trick had a soft spot for Sal and was impressed by the fact she could fit three replicated tomatoes in her mouth, so he didn’t break Morgan’s arms and legs. Trick was quirky that way. They also shared a love of Earth memorabilia, in private of course. Trick Satin was a hardened space pirate after all and in command of the largest fleet in Morpheus. Still, he had a pretty amazing collection of twentieth century Smurf figurines. It had been a challenge for Sal to get her hands on Takka before any other bounty hunter, and with the thruster about ready to implode, the five thousand credits had already been spent. It was disheartening for Sal, working hard for credits only to have them constantly swallowed up by ship repairs or Morgan’s escapades. The jump drive fund was just a box of wishes and I.O.Us at this point and as for getting to Earth, a planet several systems away, Sal reckoned she had a better chance of pushing Light Tripper there, it would just take her a few thousand years. Sal thought about Earth a lot. Morgan said she was born there, not that she could remember. Apparently they up and left when she was just a few months old. Still, something about it called to her. It wasn’t just the oceans or forests, other planets had those things too. Deep in her heart, she knew it was home and the only place in the galaxy where she could get the answers to questions that Morgan dodged like bullets. Starting with the minor fact that she happens to be electrified. But returning to Earth was little more than a dream. Even if she had the credits, it would cost more than new thrusters, more than a jump drive. To get past the shield you had to have genome tests, the proper data records and not carry the sort of criminal history that would get you arrested on sight. The Planetary Alliance were very strict on such things and Earth fell under their protected territories. Sal was abruptly reminded of Kar and his incensed hatred for the P.A and Morgan by association, but Sal agreed with Opus. The P.A were another system’s problem. They had never shown a drop of interest in little Morpheus which is why it was rife with loveable scum. Sure, Sal had heard whispers; the disappearance of entire colonies and civilian transport ships on fire, but that’s all they were, whispers. They couldn’t get away with such things. Surely Morgan would have said something? Wouldn’t he? Sal pushed Earth and the Planetary Alliance from her mind for now. These five thousand credits would go on the thrusters. That was more important, more realistic, otherwise Light Tripper was nothing but a floating mass of useless steel and Sal and Morgan were little more than civilians. Having a ship – even a wreck of one – was freedom and dignity in a system where the latter was in short supply. In Morpheus, there were two common sayings. The first was ‘trust no one’, and the second, which most Morpheans lived and died by, ‘if you don’t got a ship, get one‘. Sal would never give up Light Tripper. It was stability in a world where she was constantly teetering on the edge of the next life or death predicament, even if it was held together by dodgy welds, stolen parts and the odd touch of Sal Magic. By now they had managed to put a good amount of distance between themselves and Enos, and the scanners didn’t show anything following them. Morgan and Sal Tripp had scraped their way out of another one. Sal had input the co-ordinates for Agrios and Light Tripper was set to auto-pilot. Morgan leaned back in his chair, feet on the control panel, his cap pulled down over his eyes. He had cued up a rare laser disc of his favourite Earth music to help drown out Takka’s complaining. Sal rolled her eyes, dreading the sound of Morgan’s horrible, croaky singing voice and as soon as he pulled out the air guitar, she was on her feet and leaving the cockpit. “Let me know when Agrios is in range,” she moaned. “Dun-dun-dun, dun-dun-danun, dun-dun-dun, dun-dun. Smoooooooke on the water…” Morgan crooned. As Light Tripper made her way through space, Sal took some time for herself, hiding away in her room and locking the door. It was cramped, a set of bunks within a recessed wall, a sink and a mirror with a shower that tucked away behind a sliding panel. Of course Sal’s collection of Earth memorabilia didn’t help the clutter situation. The white walls were covered in old posters, crinkled and curled, with the odd one in mint condition. Most were landscapes, lush green valleys and vibrant forests bursting with life, however Sal was most fond of her ‘Hang In There, Baby’ poster, with a kitten hanging desperately from a tree branch, a true gem of early Earth culture. Adding to the mess were her crates, stacked almost to the ceiling, bursting with books, trinkets and plastic toys with bobbing heads. Sal had collected them on her travels, each beloved and she could never have enough. The top bunk was already starting to fill up with boxes. At this pace, she wasn’t far from having to sleep in the shower stall. The mirror was smeared with who knows what, so Sal gave it a wipe with the elbow of her jacket. She unwound her hair from the knotted mess she’d been hiding under Morgan’s cap and rubbed her scalp, humming contently with relief. Her hand brushed over the tap and water from the ship’s fluid recycler spurted into the sink. Sal wiped down her brow and the back of her neck while fruitlessly picking at the despised dusting of freckles just below her eyes. She spotted a dot of green blood and winced, scrubbing at her brown skin long after the speck had been wiped away. Morgan could of mentioned something about having Kar on her face. Sal crawled into the bottom bunk and kicked off her heavy boots. She felt a prod in her back and laughed when she realised she still had the revolver tucked into her pants. Sal yanked it out and checked it over to be sure it was fully charged; that all the mechanisms were working correctly; that the barrel was clear. She could clean a gun with her eyes closed, pull it apart and put it together in the blink of an eye, perfect every time. The PEP was her favourite but she wasn’t prejudiced. Sal appreciated and admired all guns equally and was an advocate for the adage that size doesn’t matter. The PEP though, it channelled her energy so effectively, making it almost an extension of herself. There were very few items that could do that, most exploded, appliances certainly did, she had annihilated multiple thumb imprinters in her time, but weapons absorbed her energy and became stronger for it. It caused Sal to wonder sometimes. This power that she had seemed engineered to help killy-things kill better and faster. What kind of gift was that? For now, the hows and whys of Sal’s powers were a mystery that plagued her, a key that didn’t fit any locks and until she found the lock that clicked, Sal just had to do her best to only blow up imprinters and not something more important, like herself. She patted the revolver lovingly before popping it under her pillow for safe keeping. They had never been attacked or boarded in space before, but there was a first time for everything, especially while Morgan was at the helm. As Sal lay there, she spared a thought for the dark-eyed, probably-dead stranger who had held onto her with such desperation in the Dago Lounge. Who was he? What did he want with her? And where did he find that spectacular gun? All things Sal might have gotten the chance to ask if she wasn’t running for her life at the time. She drifted off to sleep, lulled by the hollow thrum of the engines.